This “naked” cake might be lacking in the icing department but it makes up for it with its simple design and some gorgeous spring greens and flowers. The cake is perfect for a springtime wedding – it’s simple and elegant. 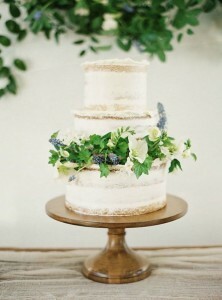 The ivy along with the fresh flowers add the perfect pop of spring color to the nearly-white cake. And, if you’d rather use brightly colored flowers that would look great too – imagine small roses in shades of pink. Oh so pretty! You’ll find this nearly naked spring cake here. It was created by Cakewalk Bake Shop.